#stampinup #faithfulinkspirations When you think floral, I'm sure you think of pretty pastel colors. I know that I do. But today's card shows you that florals can be pretty--even in black and white. I'm using the "Perennial Birthday" stamp set and a sheet of the Petal Passion Designer Series Paper as I've done for the past couple of days. If you want florals in pretty pastel colors, buy the Perennial Birthday Project Kit along with the stamp set. That way you can have your pastels and your black and white! 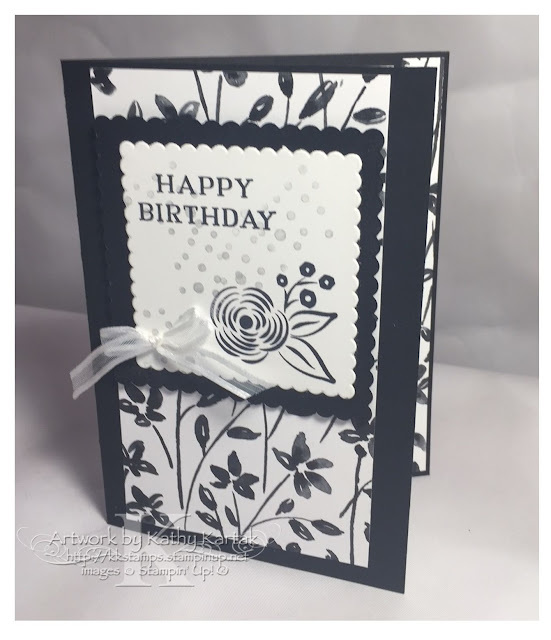 We stamped "happy birthday," the large flower and leaf stamp in Basic Black Archival Ink onto a Whisper White Card Stock scalloped square that had been cut with one of the Layering Squares Framelits. We added some "sprinkles" by inking the dotty stamp with Smoky Slate Ink and stamping off once before stamping on the square. We adhered this to a just larger Basic Black Card Stock scalloped square, again cut with one of the Layering Squares Framelits. The front flap of the Basic Black Card Stock card base has been trimmed by 1/4" inch--so that you can see the DSP on the inside of the card. On the front, we adhered a 4" by 3" piece of Petal Passion DSP. 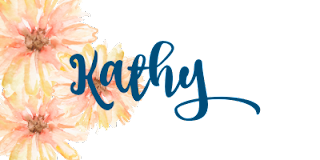 Then we used Stampin' Dimensionals to adhere the stamped piece, and a Glue Dot to add a cute bow made from the 1/4" Whisper White Organza Ribbon. Inside the card, we added a 4" by 3-1/2" piece of Whisper White for writing (or stamping) your sentiments. And we added a 1/4" by 4" strip of the same DSP as on the front. This is an interesting fold for a card. It's nice to mix things up a little bit every once in a while, don't you think?